Biblical Studies and Technological Tools: Jonathan Robie: "Needed - An Open, Trustworthy, Trusted Greek Text"
Jonathan Robie: "Needed - An Open, Trustworthy, Trusted Greek Text"
The Bible is at the heart of digital biblical humanities, and open scholarship depends on an open text that can be used in scholarly publications and translations. For the Greek New Testament, the critical editions that can be used in scholarly publications and most translations are not open. The texts that are open are generally not considered acceptable for scholarly publications or translation. Something's got to give. A new critical edition could be created and licensed openly. It's a brief but significant article worth your time reading. 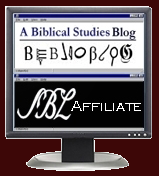 I had been under the impression that the SBLGNT--a joint project of the Society of Biblical Literature and Logos Bible Software--was basically open, but Robie points out that there are restrictions that limit its openness. (Cf. here.) Personally, I'd like to see any of the texts mentioned in #1 be opened up, but if not, I'm ready to go with one of the open texts in #2 listed in Robie's article.